Air Ministry Pamphlet 160. P/b, 14 x 21cm, 1st edition, September 1943, 24p. 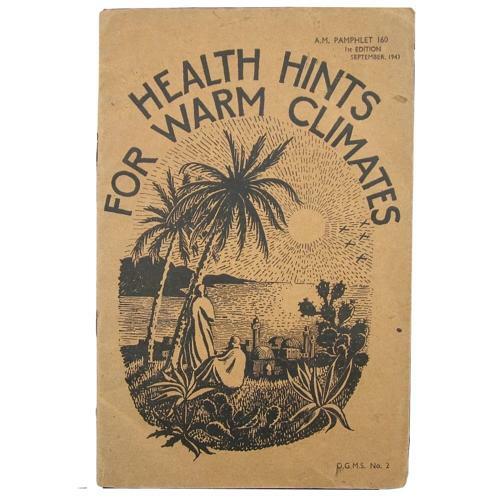 Provides information, hints and tips for all personnel proceeding to the tropics and subtropics. It covers the preparation of kit, transit aircraft and troopships. There is lots of information on mosquitoes, malaria, yellow fever and other diseases and hazards. It also covers general health instructions, personal hygiene and so on. Illustrated throughout with amusing line drawings. The cover is lightly soiled and creased. Rusting staples but inner pages generally quite good. A great little booklet. Stock code P20320.